It's a curiously hot topic, that of taking personal and total responsibility –ownership for oneself and the results in your life– however perhaps not surprisingly since we've been programmed from the start to rely on the church and state for the management of our spiritual and medical lives. But today more than ever, with all the options, information and resources at our disposal, we are empowered to shift the dynamic and take ownership over the management of our own health and wellness. And how you do that is, through building a Wellness Team. This might seem to be an impossible task, given the sheer volume mis-information and dis-information that is purposely intended to deepen the programming for us to rely on for-profit-first system that has no real “team” looking out for your personal health. Who's Looking Out For Me? Sadly, when my step-mother struggled through cancer, she complained over and over: “Who's looking out for me?”. She wondered who has her chart, and situation in their hands and on their minds. Who is working on a solution for her diligently day and night like anyone that I would hire to do a job in my business would be responsible for. She needed a conscientious member of “Team Heal-Carol” who's sole job is to play their position, executing in their space, being relentless at attacking their goal; to win the game –which would only happen when Carol, my Mother was well. This player (or players) working tireless on her chart we direly needed, but not nearly as much as the Coach of that team was needed. That's what the system is lacking today. We have all the players, but we're missing the glue to pull them all together. Thankfully, today, those coaches are emerging faster than ever, but unfortunately, the conventional health-care (sick-care) “teams” that still dominate today have yet to fully assimilate these Coaches into the system because coaches are the new paradigm and naturally, the new paradigm always takes time. Physicians, Surgeons, and Pharmacists, they're all part of the sick-care system. They treat symptoms. Coaches on the other hand (good ones at least), are tasked with understanding the person, with several, long, detailed and consistent personal meetings. They look at the whole picture, including what other players are on your team are active, what they are seeing and responding to, and if they're not active, which ones should be. Wouldn't it be nice if more Medical Doctors were empowered, not threatened by “Alternative” medicine, and by coaches collaborating in what's now clearly understood to be the goal of the new wellness based health-care system; a Complementary, Integrative, or Holistic system. An integrative system would included the bleeding edge (often mis-labeled “psuedo-science”, by defenders of the status-quo) as readily as it does conventional wisdom. We all know instinctively (and it is consistently proven to be true) that today's dream is tomorrow's reality. Science Fiction often becomes Science Fact. And the fear of the new is what kept our world flat for so many centuries. The defenders of the status-quo and sickness-profiteers are the biggest threats to our wellness today. For years I lamented, how can we bring to pass a brand new wellness-centric system, without destroying the old one completely first? Some systems are just so entrenched that the awareness and the evolution needed is a quantum leap, like that of our currency/capitalism/country based economy and society. That much larger systems' much needed transcendence still boggles my mind on how it might come to pass (if ever, though I am very hopeful). 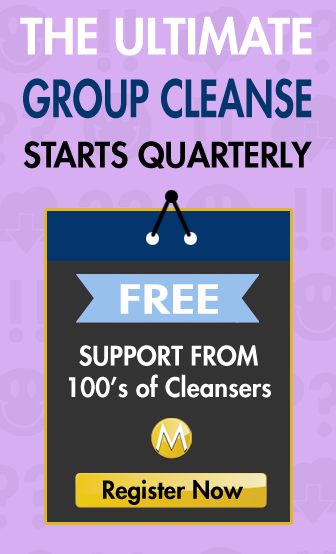 But as I worked more and more towards employing wellness coaches and developing a wellness team in my life it became very clear, very quickly; we do indeed have all the foundations that are required already in place today. We just need to continue the grass roots movement, so that awareness, then accessibility will build exponentially. I believe that in just a few short years we'll see the critical mass, the inflection point as clearly as we do today with the long-over-due re-classification of what's now undoubtedly known as a medical super-plant, and was once demonized and falsified as having no medical value whatsoever –marijuana. Just like that movement, the movement to de-centralize power in our personal health from behind the god-like personas of Doctors and dictator like policies of hospitals and insurance companies has been building for decades. Finally, our technology, information, and willingness is aligned. We have health trackers and wearables that can monitor the smallest of our biofeedback signals, and networks to communicate that information to a “Manager” or Analyst ready to pro-actively determine emerging patterns of problems and results. And, we have open-minded, integrative practitioners who are globally trained and patient-first oriented ready and willing to perform those duties, to be a member of your Wellness Team. Imagine if 7 years before my step-mothers death, and 3 years before her diagnosis, that her health manager received a series of alerts to their phones, tablets and desktop stations about a collection of measurements that indicate her body is in a pre-cancerous state. Perhaps her hormone levels, inflammation markers, and social/world view emotional and psychological measures are combining to show she's now becoming extremely hospitable for certain types of cancers to emerge. The Analyst conveys that message to a coach. 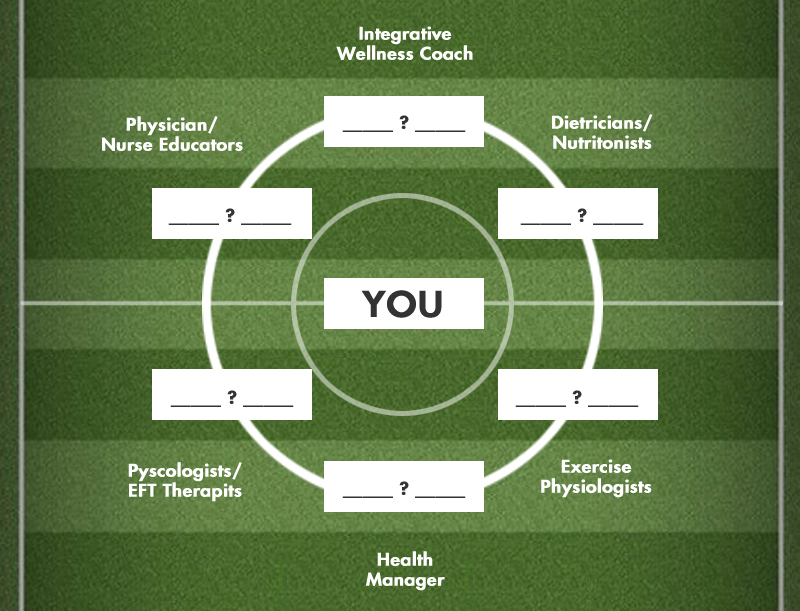 The Coach then “takes the ball”(without the need for the patient to spontaneously schedule a routine office visit to their doctor) and then organizes the people she'll need to activate, giving them the ball to run with, making plays, advancing towards the never changing goal of “Dynamic Wellness”. The Coach will tap players like a nutritionist to plan her diet, a physiologist to get her moving, a psychologist to provide emotional freedom, and additional analysts to deepen evaluations and monitoring of her testing markers. You. You are the Star Player and Team Owner. You have to be fully informed, and motivated by the coach and continually encouraged by the support from your professional team alongside you. The current biggest challenges for any conventional Doctor who would have the audacity to break from convention, are first, to find the time to understand your lifestyle factors, and second “compliance” –will the patient (you) take their advice. Conventional Doctors consistently complain that their patients don't do as they're prescribed. And it's no wonder when the patient wait times are up to 4 hours, the appointment is on average 15 minutes, and the topic (issue) of discussion is limited to 1. All these factors create a chasm of disrespect. What's more, it's hard to connect with the advice after all that, especially when it rings flat with a simple dis-interested sentence like: “Eat better, exercise, manage stress, and come see me in a couple months for another 15 minute visit” –although, you'd be lucky to even get that. More often than not, however, no integrative thought is given to eating, exercise, stress etc. but rather what medication might suit these symptoms you are experiencing. You must look at your health as a business, plain and simple. Your the boss. You're the only share-holder. The president and CEO. Your job is to vet, procure, qualify, hire and fire those who are willing to participate the new dynamic, with you as the owner of your own team, dedicated and responsible for its ultimate successes and failures. Coming from the sports world as a former minor-professional hockey player, I always easily identify with the “Team” analogy (clearly) that executives use often in business because it's always absolutely true; any successful venture involving multiple people requires team-work to work. … You must build a team. You are looking for people to fill the roles that you currently fill on the team, to identify the roles to be occupied, and also ensuring that those we recruit have the attributes needed to compliment their teammates and will contribute more often to the success of the team, not the failure. A team huddles, plans and executes (even when you're not playing). The members of your team that you recruit along the way are subject to your objectives and intentions. If they don't fit the mold, simply let them go and find someone that will. The problem then becomes, what does this team look like, and how do you go about building your Wellness Team? Sick Care: The business of treating your symptoms through prescriptions and surgery. The difference is obvious, but perhaps the biggest take-away is the formation of the players. The new system is de-centralized and cyclical. Yes, there's a center (you), but you're not a roadblock to the rest of the team. NOTE: This looks like a lot of people to consider let alone utilize (and it is). Unfortunately that might lead you to think it's too much for you to accomplish on your own (and it is) –which is what the team is ultimately meant to do for you. So have a look and understand all the players and team-mates that are out there, but realize there are only every a few active roles on your team, and the most important ones are “Super-Stars”, they're getting a lot of playing time because they're always useful. 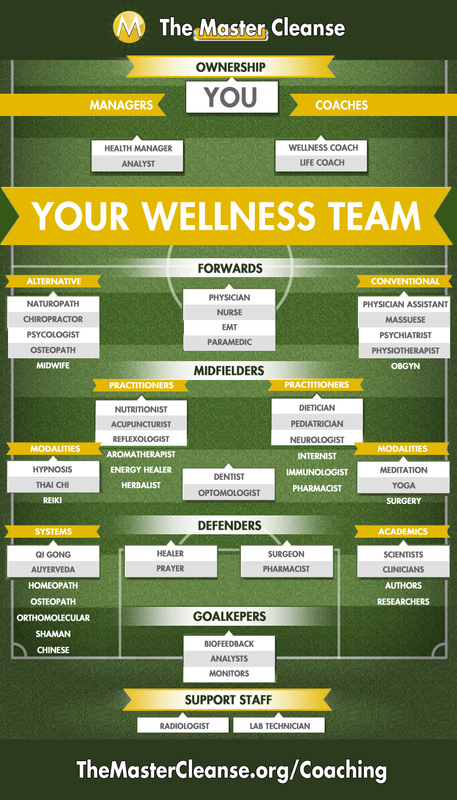 Now before we look at the whole spectrum of potential players/members of your team let's talk about a few zones of the Wellness Field (if you will) that the InfoGraphic refers to. Practitioners and Modalities: There are those that “do the doing”, and there is “the thing they do” (so eloquent). We can't have one without the other. Some do more than one. Others are done by yourself. Alternative / Conventional: The World-View alignment of health care sets the equation for defining Integrative Care. More Progressive /Alternative (on the left) + More Conventional (on the right) = Integrative: Stop looking at one side or the other with more or less approval and trust. Allow for all fields to contribute. Position and Depth: Each Position; Ownership, Management, Forwards, Midfelders, Defenders, Goalkeepers and Support: indicate levels of engagement and areas of speciality. The Depth at the Position reflects your options for a Team Member. When choosing your (Forward) Physician, you might look left for an Alternative choice, then look down the list of available players from whom you can choose to provide care for any specific current need. Holistic Health Systems: Practitioners and Modalities either are exclusive to or selective of, special aspects of a larger known body of study, collectively known as a “System”. All these systems have merit. It's best you just decide that from the beginning, even if you don't readily see it. What makes the use of these systems “Holistic” is the flexibility to use aspects of each when appropriate as part of the greater objective of wellness. Progressive and Independent Academia: We learn from writers, scientists, and researches of what's coming down the pipeline to be heralded or scrutinized, (but never ignored) by our team, knowing those that agree or oppose are merely reflecting their current world-view. It's critical to choose sources that you know to be cutting edge, while maintaining their objectivity. Our team must learn to discern propaganda by corporations and special interests and that sadly, money is perverting most media, universities, governments, and even the studies we most often cite as “fact”. What's more, if anyone on your team thinks facts are static, leet them go immediately, there is nothing we “know” 100%. Facts change every day. The world was flat, then it wasn't. Gravity was understood, now it isn't. The most obvious of the human conditions is that we will never fully understand the vastness of our infinite universe and the reality we occupy. This is the part you clicked-over for and what the reports title teases. Let's get into detail about these team members as well as how to find them, and who will pay them (that should be fun). 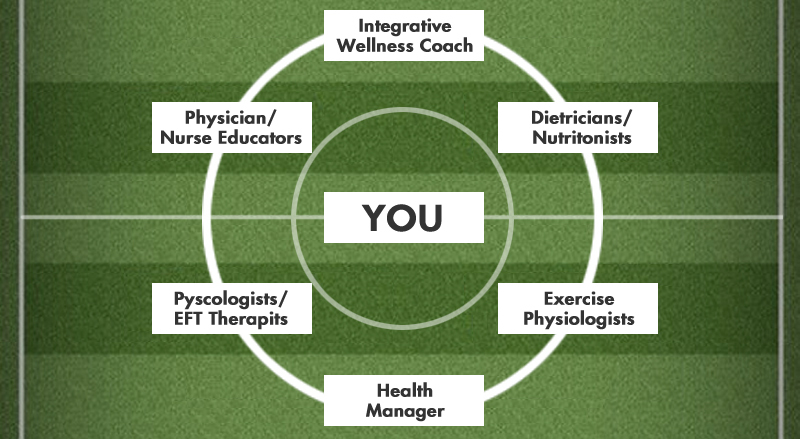 Those that follow are fundamental positions/roles in the Integrative Wellness Team. You: Everywhere you go, there you are. 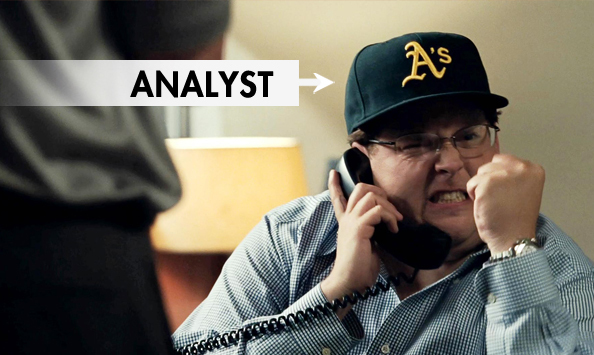 *The General Manager: Like a coach, but more a hybrid analyst and human resources manager. *Wellness Coach(es): Someone who's in charge of communicating with your team (mostly yourself), developing a “Game Plan” with Ownership and Management and ensuring engagement with the game-plan. Often there are Co-Coaches who focus on different aspects of your life, like Life-Coaches, Health-Coaches etc. that can be combined into a larger team especially when you're building a team for your whole family who have varying issues at any one time. 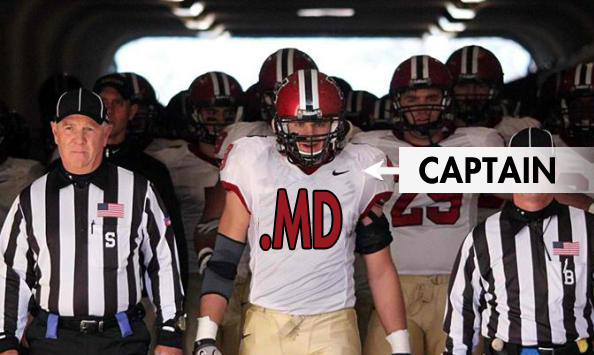 Local Physicians (Team Captains): Your (original) primary care provider. The local Doctor you'll see for various issues that need direct attention which also includes; Urgent Care Provider, Emergency Provider etc. They are who we turn to when we need a big play and we need it now. +Psychologist / EFT Therapists: Your Mental-Emotional Dynamic is arguably the most important aspect of your “Dynamic/Integrated Bodies”. It's been proven if the mind/soul of a person is toxic, the best foods and exercise in the world alone won't prevent disease. +Physiologist: Daily, weekly, monthly and quarterly consistency in activity, but also freshness (Intervals) to keep you engaged, and to keep it working. The body (and you), get used to (bored), by the same exercises over and over. These roles are filled by Personal Trainers, Physiotherapist etc. +Dietician: Someone who can dynamically work with you to keep your diet fresh too and ensure it is precisely useful considering the current reality of your wellness including; Dietician, Nutritionist, Herbalist etc. The top 7 players are made up of Ownership, Management, Coaching, Forwards and Mid-Field Positions, and the last 3 are readily substituted for any practitioner you feel you need consistently in your life. 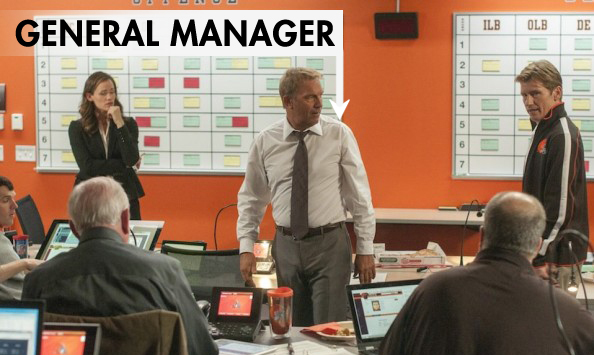 * The asterisk on Manager and Coaches indicates you'll likely fill these roles by yourself if you have a small budget. The rest of the positions are complementary in a true sense of the word to the fundamental Super-Stars needed as the foundation of your team. Associates and Assistants: Managers, Coaches and Captains all have their own complements. 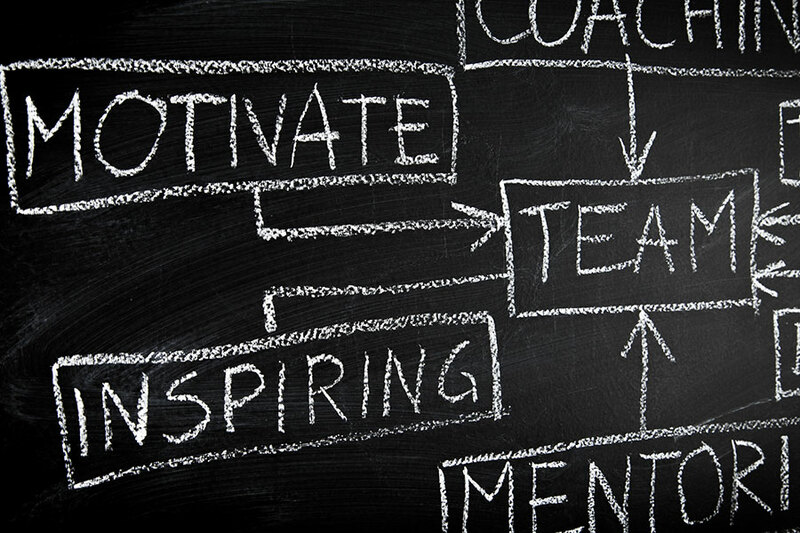 Life-Coaches, Analysts, Assistants all come into play and star in their own roles when needed. Specialists: So many practitioners and modalities, many of which you can use to complement even in the most well state, but most are used only when needed to correct an imbalance simply due the untenability of doing everything all the time. These include Biological Dentists, Ophthalmologists, etc. Defenders: Should be the last line of resort, which the old system likes to put first, and often fails to recognize alternative treatments. Goal Keepers: Tools and Systems to track and monitor your current reality as well as the goals you've set so that you know where you're at, where you're going, and what's needed next to get there. These tools are used the General Manager to ensure the right players are on the field. Ideally, Goal Keepers should be Insurance companies, if they were re-imagined as more of warranty companies that practice “Behaviorally Modified Benefits”, rewarding you for having a Wellness Team, and how you engage with it. Technical Support Staff / Contractors: These specialists will take readings and measurements of your wellness that the tools of the Goal Keepers that perhaps (currently) can not take such as many blood test, urine tests, x-rays, MRI and other imaging technologies. 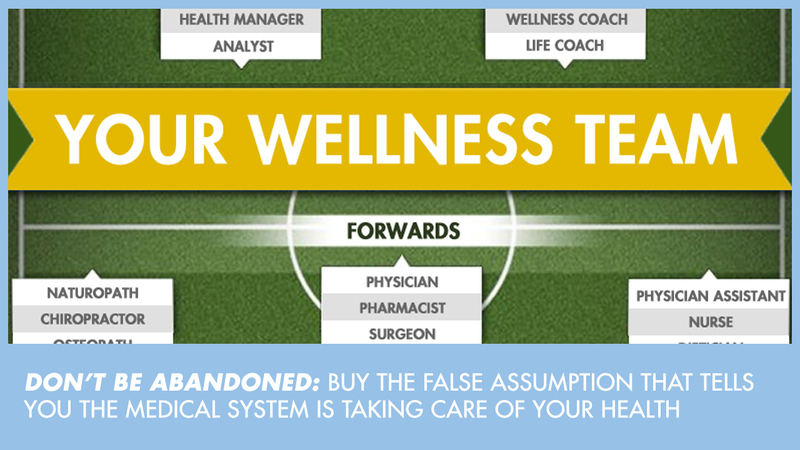 With all that said, and without further adieu, here's Ideal Wellness Team Infographic. NOTE: You may need to “Right Click” / Save Image As etc. Remember, you don't need all your players/members at one time. Keep these two ideas as your primary directives to make this actually actionable. Focus on Top Down: The top roles must be filled because they select and activate your specialist roles so let's wipe the table clean and fill those first. Fill Multiple Roles Yourself: You're Pete Rose, Michael Jordan, or Mario Lemieux (and other famous player coaches). You're the owner, player and coach, at least at first out of necessity. Learn what you do well, and how you can let others do the rest for you. Now let's go ahead and look deeper at the Super-Star Players and how they will work within the team. As the “Owner” you are the most important member of your wellness team. You are the one who is obviously most directly affected by any disease and cares for it every day, moving diligently towards regained wellness. Only you know how you feel and what you're willing and able to do. You make and eat the foods in your meal plan. You check your blood sugar (glucose) levels and keep track of the results (or at least you did in the past). You are the first to notice any problems. And, you're the one who reaps the benefits when you're feeling well, with the energy of life flowing through you and all around you so you can enjoy your favourite things life has to offer. I know you're probably not a dot.com billionaire (or are you), but you do own the franchise of your life. 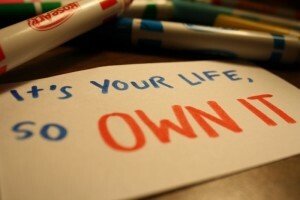 So truly OWN IT! Now that you've taken personal responsibility for your wellness, you are accountable for assembling the best team around you possible, starting with The General Health Manager. Like all great team owners, you don't want to spend all your time “in the weeds” of the day-to-day of your business or team so the first hire you'll make is the General Manager who is specifically responsible for details of your current “Health” status. I use the term Health with regards to the process of management because that term, to me, feels like something that needs managing. It's not as wholesome and cuddly as Wellness. Wellness speaks to your state of being. Health speaks to your state of affairs, the statistics of your Wellness. The whole idea of health is made up of so many details, you probably wouldn't know where to start to manage them after-all this is an rapidly and recently emerging field. With the also rapidly and recently emergence of health tracking and monitoring of health metrics using wearable computers, as well as easier/cheaper access to new and advanced biological lab testing we now have way to much data to efficiently manage let alone consider. This is Analytics for your Health. Healthalytics, if you will. Frankly, your specialized team members (or players), don't have the time to focus on these details of your health. Ask them if they think their doctor has the time to take your chart, file etc. home to dig deeper into your life and ponder what might be bother you now and around the corner. In today's world, this role isn't well defined and the person who would take up this role might not even know this type of role exists. Sourcing, Hiring and Retaining other team members (the coach, players etc. ), putting the pieces of the puzzle together. Track and Manage your Profile/Chart including various biometrics using modern, online, sharable and actionable tools. Looks for Opportunities and Challenges in your dynamic health status, being proactive by nature seeking always to achieve wellness. This would be done periodically on schedules like Daily, Weekly, Monthly, Quarterly, Annually, Bi-Annually etc. just like the maintenance schedule for your shinny new car. But it would also be done upon demand, triggered by changes in the tools used by yourself to track your health. NOTE: This person could be mistaken for what often is currently called your “Primary Care Provider” such as your family doctor, but if you look back over these qualities you'll see this probably isn't the person you call when you have an issue you need to attend to. Likewise, you wouldn't ask your Local Doctor to do all the tasks I just listed (could you imagine)? Please, someone ask their Doctor if they would do that and video their response. This person would however, be informed of your visit to your primary care provider and would then be tasked with looking for any emerging patterns that might require attention. If this task falls on you, that's OK. Just put your GM “hat” on when you need to, for an hour or so each month and knock out the tasks in their purview. Just think like they would, do what they would do. When you're done. Take off the suit and tie and put aside that way of thinking and just be the Owner again, basking in the glory of your team and wellness. The Coach is the first person you'll go to for information, advice, support, education, training, motivation, etc. A good Wellness Coach will take their time to get to know you, and will always keep themselves up-to-date on your current reality regardless if you make an appointment. They are tasked with nudging you to communicate. Then they'll see ways towards a balanced, well state of being and finally, effort to maintain it once achieved by adjusting their approach and keeping you motivated. 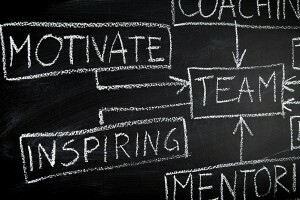 Perhaps most importantly, the coach will take the lead in communicating with your Team Players (other practitioners), so that they understand the results of your tests or treatments and can seek the next way forward, devising the next “Play” if you will. They also line up the next players to be in play. If you now need Physiotherapy, then that's the next player to be tapped by the Coach to take the field. Not many “Primary Care Physicians” (MD, ND etc.) are what we call “Integrative and Precision” based, let alone are naturally gifted or willing coaches. Doctors can develop that “God Complex” even if only a mild case, and may treat your insights as beneath discussion. They can get defensive at the mention of your own personal research going so far as to diagnose you with an obsessive compulsive disorder (OCD) or even laugh at you as I can personally attest to. As will our Health Managers and their responsibilities, obviously we can't burden our local Doctor with coaching requests. If you find one who's a natural, great. You might still want to hire one that's dedicated to the objective, and can give even more time, and provide greater access in times of need. Also like the GM, Coaches have associates and assistants, and they may come and go as you need them. You may hire Co-Coaches, one who focus on Wellness, while others specialize as a “Life Coach”. You may need to turn online resources, utilizing remote coaching for your deep and personal correspondence and collaborative meetings to discuss you wellness. You might say, “how will an online, remote Doctor evaluate my broken leg, or evaluate my swollen lymph nodes”. While I don't suggest that's the ideal, it does seem to be the norm. For these needs, you'll simply add another key role player to your team, someone that you can go to for these timely and personal examinations; your conventional Primary Care Provider, Doctor or Physician. The first true “Player” on your team should be the leader of the team. As your primary care provider in a conventional sense, of course your Local Doctor is the Captain of your Team. They are the first on the field when we need local attention. This is who you'll go to see if you have an issue come up like a flu, cut, burn, or an unknown physical ailment like acute or chronic pain. They keep office hours but they are not alway accessible so we'll need assistant captains in Emergency and Urgent Care providers when our daily issues that need immediate or near-immediate attention. Your Local Doctor could very well have attributes of a great Manager or Coach, but not likely both, and not they're likely to be as available as you might need them to be in order to be effective in those roles. But, if you scout well, and recruit aggressively, you can find a Physician who will serve the role as a local point of contact and is progressive thinking enough to recognize the need for the team you've built. When you find a great, integrative leaning MD, they often will make a great referrer of others to join your team, as they say: “birds of a feather flock together”. NOTE: I use the terms MD, Physician, Doctor, very loosely to describe any medically credentialed professional capable of diagnosing disease, prescribing and altering medications, and making referrals to other specialists etc. as commonly defined. These are all the “gate-keeper” functions of the conventional medical system that are still useful in our Integrative system, because we're seeking other practitioners as well. We very well might be able to have those functions served elsewhere. All you'll need to do to qualify these people is to address their basic competence in a conventional sense, and more importantly, their willingness to collaborate with your team in a timely, and digital fashion. Now that you know some interesting theories, it's time for action! Remember you might fill the role of Manager and Coach for the interim, but those two roles are the foundation for your whole team. The sooner you can empower a professional to do what they're trained for, what their paid for, the sooner you'll start seeing profound, permanent changes in the way you look at your health wellness. Health Manager: If you have the budget to mostly fill your team then you should hire your Health Manager first because they will be able to aid you in hiring your Coach and Physician next. Wellness Coach: If you can only budget for just 1 Alternative consultant it should be your Coach, because they will get you engaged, and that's the ultimate objective. Local Physician: If you're taking on both Manager and Coach roles, then of course hire your Physician first, and focus on screening questions to see if they have any attributes of a Manager or Coach in them. Each of these individuals are professionals and as such there is a market for them to be recruited from, qualified (screened), and hired to work/play on your team. Each must be found in different marketplaces which is why it would be very helpful to recruit first someone who specializes in knowing how to research and communicate with other health professionals. This position largely doesn't yet exist. The person you're hiring might not even know they are a Health Manager. That's ok, we do. And we just need to find someone with the right attributes who would make a fine manager, and in a sense, train them on their responsibilities. Where to find them: Look on contractor/freelancer sites like Upwork (formerly Odesk), Elance, and Freelancer.com for Administrators with experience in the health field. Project Managers will fit nicely. As will researches, consultants and technologists who have a complimentary soft-skill-set. What to ask them: You'll want to qualify their skills in research, analytics, communications and management. They'll be tasked with finding like-minded professionals as you need them, managing your tracking/analytic tools as well as communicating with your team directly so then need to know what's up. They need to be advanced and experts in their field and are passionate and dedicated to their skillset. How much to pay them: Candidates from developed countries will charge $50 – $500 / hour. Yes that's a big difference. Doctors like Dr. Hyman a renowned and famous Integrative Physician charges $500 / hour. His staffed doctors charge less as do their practitioners. Since you don't need a Physician necessarily for this role, you might land around $150 / hour which is typical for an expert consultant who isn't hedging their rates to the max a market will bear. Developing countries, those often targeted for medical tourism for example, can yield experts at 50% to 10% of those rates. 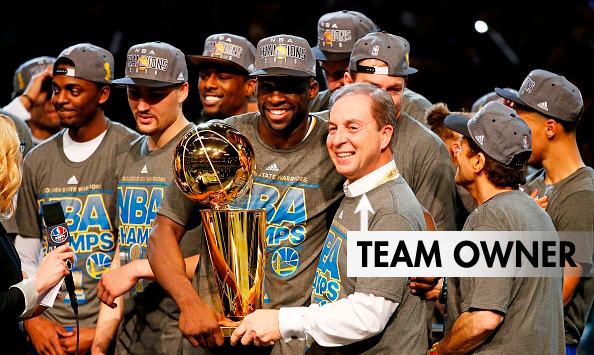 Dr. Hyman is a great example of a 1-stop shop for building your team (if you can afford it). How to train them: Don't be fooled to think that these experts don't need training. It's just that you should also not be so foolish as to think you should train them on what they're already experts in. You'll need to educate them on your objectives and get on the same page on how often to communicate, what tools to use, common sources for finding team-mates, and the common cultural attributes you seek to align with. How to manage them: You'll need to ensure that the goal of transparency and communication is kept clear, while at the same time guarding against micro-managing, or frankly being over-billed. These are after all hourly rate contractors. If they work more, they make more. You'll need to set defined limits of scope, and stick to them. Thankfully, finding professionals to fill these roles will not be hard at all. 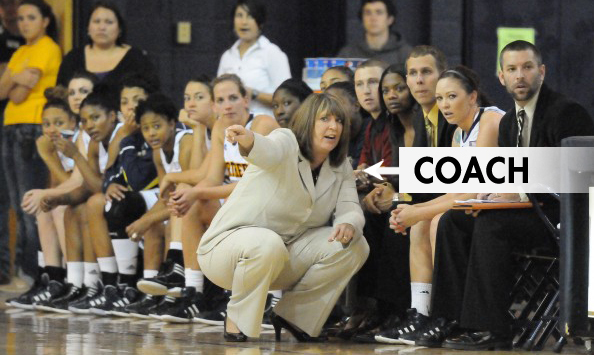 There is no shortage of newly minted coaches. And there-in lies the rub. There is an exceptionally low barrier to entry to becoming a Health/Wellness Coach, way to many accreditation services to know which one is meaningful, and so many subsets of coaching that the pool for a truly “Integrative” coach gets diluted quickly. Where to find them: There are a few high quality Health Coach schools that have emerged and have stood the test of time (albeit we're talking years not decades) like IntegrativeNutrition.com (directory currently offline), WellnessCoach.com, Duke Integrative Medicine, TheHealthCoachGroup, Holistic CMBA, WellCoaches.com, and CoachFederation.com that have directories of they graduates and tools to find them. What to ask them: First recognize that you need to ask yourself as many important questions as you should ask a potential Wellness Coach. Google “How to Hire a Health Coach” to find articles like this one to help you craft an “Interview Script”. As is true with all your “Star Players” you'll want to make sure they adhere to your core culture (Communication, Digital Self-Care, Tracking, Analytics etc.) and the greater objective of your team as you understand it. Most importantly, qualify them as more general Wellness Coaches, rather than the dozens of specialties. You want someone who at least has an understanding of as many of the core methodologies/issues you're working with. Ask for at least 15 minute screening/consults for your interview. Research them online and ask for and read their materials if they have them. Check Certifications too. How much to pay them: Like the Health Managers the range for contract services is wide and varied by talent and individual perception of worth. Shoot for the best person at the best rate. You should have a floor limit on quality that you simply will not go past. Then short-list to the lowest priced 5 candidates and choose. You'll probably find again that $150/hour is a good target. If you can get someone in a developed country for $50/hour you've done great. They're out there. And again, the talent abounds in developing countries as well. How to train them: A well screened and hired Wellness Coach will not need nearly as much training as the Health Manager since they probably already know what they are and have been doing it for a while. But, that should not stop you from initiating them into your Team Culture early and often. The biggest change for them likely is the concept of the Health Manager as this role may or may not have been filled by them in the past. It's likely however that this aspect is new to them as well as the technology for managing your health is emerging rapidly using tools like NudgeCoach.com and WellnessFX.com. Compartmentalizing these responsibilities will pay huge dividends as Coaches generally don't have the same inherent skill-set as Managers. They may not agree, but history tells us differently. How to manage them: As with the Health Coach, you'll need to ensure that the goal of transparency and communication is kept clear, while at the same time guarding against micro-managing, or frankly being over-billed. Coaches are also hourly rate contractors. If they work more, they make more. You'll need to set defined limits of scope, and stick to them. You'll also need to clearly define what areas of your life they may coach you in. It's easy for coaches to over-reach into areas they have not been granted purview. Last but not least (ideologically) is the Local Physician. This could be your greatest challenge. Since most of us have a Doctor already, we are already emotionally attached one way or another. Surprisingly, even Doctors to whom we feel negatively we have a hard time leaving for another, either because we feel they're a reflection on us (our ego doesn't like to admit we chose poorly), or because the thought of finding another one, let alone a new “good” one seems as daunting as it can be (sorry about that). Where to find them: Starting in your city/town/village, there may be only 1 or 2 Physicians who are “accepting” new patients, if there are any at all. Doesn't that seem like you're stuck before you started? Of course you should look at those who are accepting new patients, but also look at those who aren't. If you're certain the one for you is perfect but just too busy. Call them. Make a case. They might open a spot for you or notify you when they are accepting new patients. Next, expand your research to the next city/town/village over and don't stop until you've found a candidate. Check rating sites like RateMD.com, and HealthGrades.com. 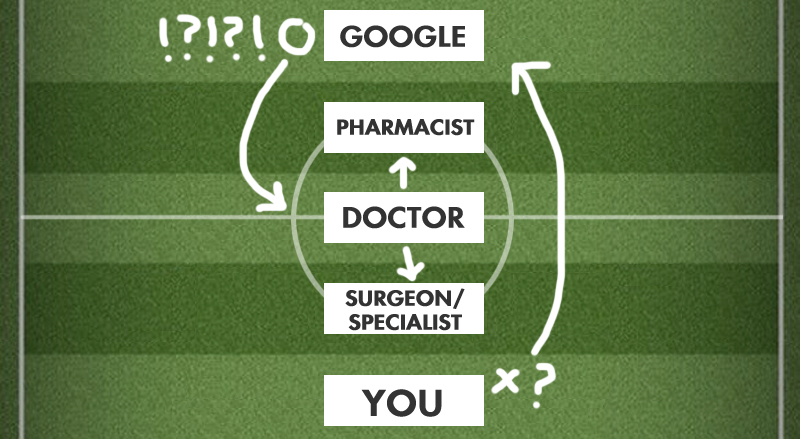 Google “how to find doctors accepting new patients” to find several tools and directories. Also, check with your Insurance Company for directories and to check to see if a Remote/Virtual Doctor is acceptable in some cases. If you still can't find one in your immediate local area that meets your standards then you need a hybrid approach. Either find 2-3 that collectively meet your needs, or 1 pretty good local one, and then try to find a remote Doctor you can engage on a Doctor/Patient relationship via tele-conference. What to ask them: This can be much more complicated than screening a Health Manager or Wellness Coach because so many Doctors are still “Conventional”. You'll want to have many trigger questions that evoke their true feelings on controversial subjects like mid-wives, vaccinations, over-prescription of pharmaceuticals and surgeries etc. Gauge their reactions and check them for alignment with your core values. You'll also want to ask them several questions that screens out those with God-complexes who feel their ivory white towers should keep their patients at a distance. Ask questions like: Can I email you? Can you send me digital copies of my file immediately and without request to keep my management up to date? How long are your average appointments? Do you keep office hours for file review? What's the ratio? How many patients do you have/see per day etc. How much to pay them: Fortunately, most of us have this covered one way or another with some basic government program, but not nearly all of us. And for those of us that are some-what covered, we may have not found our ideal collaborative Doctor and are stuck in hybrid land needing someone remote that perhaps insurance doesn't cover. Or perhaps, like myself you might be travelling frequently, and may end up paying directly for Doctor services around the world. In those cases, this question is very hard to answer. Prices are all over the map, literally, and I would encourage you to look all over the map. You might very well save money over carrying insurance simply by paying out of pocket for consults with board-certified, and often Western-trained Physicians remotely via Skype. As in all cases of recruitment, have your manager research options. Throw out the cheapest and most expensive. Find the best option at the top end of the middle. How to train them: Assuming you're found the “perfect” Doctor, you might not need to train them any more than you would have to your Manager or Coach. You're plan/system should emerge over time, and you simply need to communicate that to your enlightened MD. How to manage them: If you haven't found the most Graceful Doctor, you'll need to manage that Doctor like your slightly disgruntled but nevertheless invaluable and indispensable employee. You don't want to lose them, and you want to get the best possible work out of them. Therefore you'll need to find a balance of which requests for relationship with they will accommodate and which they will not, and then find a way to seek fulfillment of your other needs elsewhere. If they balk at digital files, request paper ones regularly, and have someone, or yourself digitize them. You always have options. If you can't find a compromise, begin your search for a replacement, then let them go ASAP. NOTE: but be very careful not to cut corners on quality here, especially since these team members are not full time. You many need them just an hour or two per month. Health care is rapidly evolving, from the rise of Health/Wellness Coaching to innovative new ways to pay for health care such as what I call “Pay Per Wellness”. The time is rapidly approaching when we will no longer simply hand over our hard earned money to a system of “sick-care” professionals who merely treat symptoms of disease and are who's only incentive is to keep us sick so they make more money (even if they don't know that's what they're doing). If we remove this intrinsic motivation (more money for shorter patient visits, and more prescriptions etc. ), the system will evolve naturally. What if we paid our care providers a basic “membership” fee for having us as their patient and limited them to how many patients they can have, which would result in a well-paid income, but not that unlike the rest of us who went to school for several years (perhaps upwards of $100,000 per year plus), but also not the extravagant upside of millions of dollars earned simply by seeing more patients for less time each, and pushing more products by companies who pay more promotional fees. Then, if we're well, they get bonuses. For every year we're well double the bonus. For every time we're sick and they get us well again, you guessed it. BONUS! 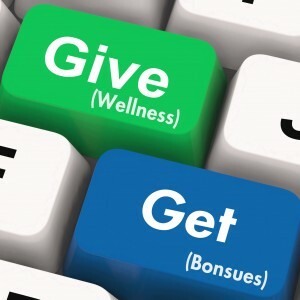 We could build into the system enough Wellness Bonuses so that they can eventually make millions per year, if they have 80% of their patients well 80% of the time. Sure. They should be paid extremely well. Now expand that idea to our whole Wellness Team. Bonuses all around. Visualizing ideals aside, someone or some “system” has to pay for our Managers, Coaches and Doctors today. Wouldn't it be nice if our existing Insurance Providers would cover the visits to our Coaches as they do other complimentary services? It turns out some do. You'll need to check your provider to see if yours does. If they don't, ask them why not, and that you're more likely to stick with them as a provider if they choose to start. Then follow through, and start seeking a replacement service provider until you find one that does. As a BC resident in Vancouver, Canada, I pay a premium for our (not) free health care of $72/month (not all provinces have this, in fact I think BC is the only one). But that's just for me. My family is $144 / Month. And they don't cover much. That's ZERO “extended” services for “Wellness” practitioners like Chiropractors or Psychologists. To get those benefits I need to buy extended coverage at $237 / Month to cover my family. And this doesn't even cover travel outside of our province let alone our country. To buy emergency travel insurance at an affordable rate with a relatively high deductible I went to BlueCross and paid $327.82 for my family for 3 Months. That's $109.27 per month. Now consider that “Global Health Insurance” companies can cover me well beyond the limits of what I currently have for far less, and I can source and screen them like any other service provider. Mind you that's USD and I pay CDN so adjusted for average call that $400 CDN. I'm still paying $90.27 more per month for less benefits. While coaching isn't usually covered by insurance, some companies like Humana, which insures more than 12 million people, have begun including in-house health coaches in their benefits packages. 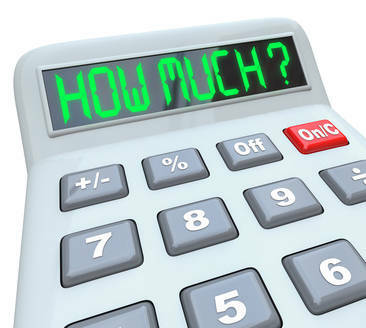 Now consider that the average cost per person per year in the USA for medical/health benefits is – $7,910 / Year or $659 / Month as part of 2 Trillion Per year in costs. We're paying double what we should. And we're getting sicker and sicker with more and more incidences of diseases like cancer, autism, multiple sclerosis, and even “lesser” issues like allergies skyrocketing since our modern medicine culture took hold in the 1960s. Finally, consider that insurance companies are covering more and more “Alternative” / Wellness based treatments not just as a complimentary service but as a preventative scheme to actively reduce the premiums for those who engage in those services regularly. Imagine again, if our health care was more like a warranty that was discounted as we utilized it because the cost of maintenance is far less than the cost of the results of the lack of maintenance. For those of us with Coaches, Managers, Health Trackers that log their Wellness activities etc. we would ultimately pay less because we're costing the system less. I am not sure how far I would go to lower my premium, by sending detailed data to a big-brother like insurance companies daily or even in real time. But I am sure I would do a fair bit to reduce my payments while balancing my privacy. I am 100% on board with reduced premiums for simply take a pro-active, and responsible approach to my wellness, virtually “insuring” (pun intended), that the cost to pay for my Health Care will be lower than the average, resulting in profit for my insurance company results in win-win and the proper incentives all-around. 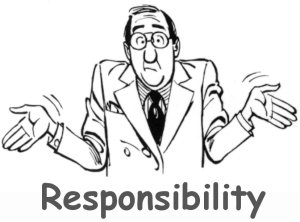 For that I am willing to take responsibility. But ultimately, I am responsible for my health regardless of the my personal expense. It's my life. And I plan to care for it at least as good as care for my fantasy hockey team, or small business. 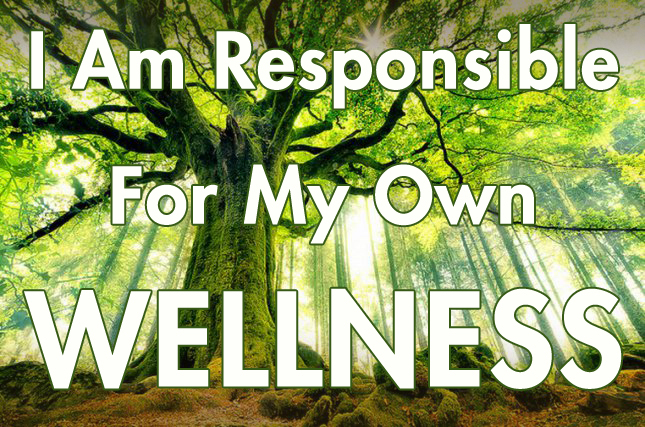 I am responsible for my own Wellness. Please, leave us a comment. Who would be on your team? Who did we miss? Where are we wrong, please, we'd love to know :) These are emerging ideas, and we'd love to hear yours. hi/ this is a good article. wanted to save this to pdf for a friend of mine who avoids public sites. how can i get a pdf ? Hi Paul, thanks. I enjoyed writing it. You can download the PDF of the Infographic and the Report by sharing the page using the Share Tool directly at the end of the article or below the full graphic of the infographic about half through.